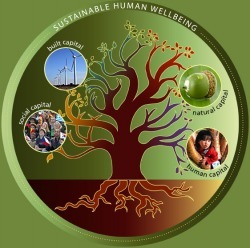 Sustainability has been defined as the ability to maintain balance of a certain process or state in any system. It is now most frequently used in connection with biological and human systems. In an ecological context, sustainability can be defined as the ability of an ecosystem to maintain ecological processes, functions, biodiversity and productivity into the future. Sustainability is expressed in human organization concepts, such as; eco-municipalities, sustainable cities, and human activities and disciplines, such as; sustainable agriculture, sustainable architecture and renewable energy. For humans to live sustainably, the Earth's resources must be used at a rate at which they can be replenished. However, there is now clear scientific evidence that humanity is living in an unsustainable fashion, and that an unprecedented collective effort is needed to return human use of natural resources to within sustainable limits. The timber industry has long been essential to produce jobs and manufacture products in our country. This has been, alas, at great expense to our environment. 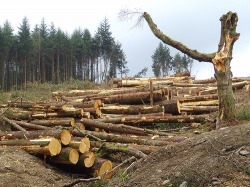 Logging destroys forests, hurts streams, kills animals and plants, wipes out species, and pollutes our environment, to name just a few of its problems. Still, the resource has been essential through modern day and so we keep cutting down trees. Now it is time to stop, before we lose more of our precious heritage. Today we make 93% of our paper from trees, including cardboard, printing paper, newspaper, etc. We use almost 40% of our forests for timber. This fills our water with nitrates, and that has terrible effects on the ecosystem. One quarter of our forests are critically imperiled, meaning they are vulnerable or unique. Many of these critically imperiled forests are not currently protected and could be destroyed any time. This problem even reaches into our wallets. We gave the Forest Service two billion dollars in subsidies from 1992-1997. This means we are actually paying taxes to destroy our own trees and heritage. Cannabis Hemp can replace any of the products made from timber. No more forests would be needlessly wasted. This would save precious resources and renew the ecosystems. More importantly, it would mean more beautiful heritage to grow for our children. Cannabis could be used for particleboards of any size, as well as insulation, drywall, cabinets, and furniture. We could build a house from Cannabis Hemp materials without excess pollution, and without cutting down a single tree. Logging our trees is without cause. There is no more need to waste our land when Cannabis Hemp could easily replace our timber. This destruction reaches into the homes and pockets of every taxpayer, and meanwhile our children cannot play in the streams and the logging industry gets another needless government refund. Now it is time to turn to the future. Hemp is our solution. How Can Hemp Help Create A More Sustainable World? OUR FOUNDING FATHERS GREW HEMP! Global warming is not a myth. Many people see Global Warming as the most threatening force of destruction on our planet. Global Warming is linked to a number of other environmental problems affecting the earth Millions of people would die as a result of global warming if no changes were made. Briefly summarized, global warming is the increasing buildup of Carbon Dioxide in our atmosphere. Carbon Dioxide is released when fossil fuels, such as coal or petroleum, are burned for energy. In the last 100 years alone we have increased our CO2 levels by 30%, with a noticeable effect on the environment. Our sea levels are rising, the global temperature is increasing, our glaciers are melting, and scientists predict further and more massive levels of destruction in the coming years. The dependence on petroleum products and fossil fuels could potentially ruin the earth, making it possibly uninhabitable in the coming centuries. It is possible to produce all of our energy with Cannabis Hemp. The unique growing properties of the plant make it the ideal crop for our energy needs. 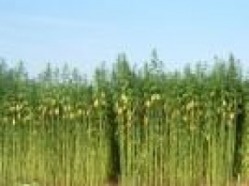 One acre of Cannabis Hemp can produce 1000 gallons of methanol in a single growing season. Any CO2 released from burning Cannabis Hemp would be the same CO2 the plant had already taken from the environment, creating what is called a closed carbon cycle. A closed carbon cycle system of energy production would slow down the effects of global warming, and with well-implemented plant growth could possibly stop global warming entirely. No other plant on earth could meet the needs of global energy consumption, but Cannabis Hemp could. Our automobiles account for much of the CO2 released into the ecosystem. Already electric cars are available to the public to promote reduced gasoline consumption. But electric cars are inefficient, and the support structure for this type of automobile is not in place. In 1998 transportation fuels accounted for almost 500 million tons of CO2 emissions. Meanwhile, our gas prices are skyrocketing, taking money directly from our pockets. Cannabis Hemp can produce a clean-burning, energy efficient form of gasoline, with less cost to the consumer. Already, ethanol is added to gasoline to increase octane levels and efficiency. Henry Ford of Ford motors believed that eventually all cars would run entirely on ethanol. Cannabis Hemp can easily be fermented into alcohol in the form of ethanol. Small ethanol production stills from corn and other crops already exist in the United States. Making ethanol and gasoline from Cannabis Hemp would further reduce CO2 emissions and help regenerate our suffering planet. The National Renewable Energy Lab in Colorado, the Environmental Protection Agency, and the U.S. Department of Energy have all stated that to help the environment, we must produce bio diesel and bio ethanol. If ethanol production proves too daunting, and more immediate solutions are warranted, cannabis hemp can also be converted into fuel oils to produce gasoline directly. Cannabis gasoline would not contain other harmful emissions associated with automobiles (such as sulfur), but it would release carbon dioxide. Still, as mentioned earlier, this CO2 would be the same CO2 the cannabis plant had already absorbed, and so there would be no net increase.